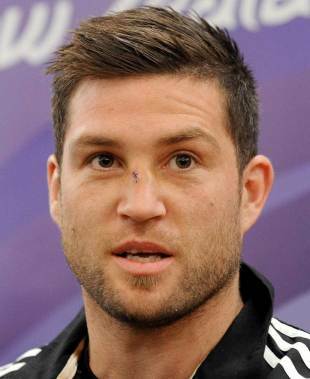 Cory Jane made his international debut for New Zealand in their 2008 Hong Kong Bledisloe Cup Test, his call-up just reward for a superb run of form as Wellington reached the final of that year's Air New Zealand Cup. While he made his provincial bow with Hawke's Bay, it was with Wellington and the Hurricanes that Jane made his name. He won a further cap on the All Blacks' November tour, coming on as a replacement against Scotland, before winning his first start against France at Carisbrook in 2009. He won two further caps against France and Italy before getting his first taste of Tri-Nations rugby in a victory over Australia in Auckland. The fleet-footed Jane returned to the All Blacks' starting line-up for the Tri-Nations finale against Australia in Wellington and celebrated by scoring his first Test try. After being included in the squad for the end-of-year tour of Europe, he racked up his second try in a win over France in Marseille. Jane was a regular in the All Blacks side throughout 2010 and bagged four tries in 11 appearances. However, poor form for the Hurricanes during the 2011 Super Rugby season put his place in the Kiwis' World Cup squad in jeopardy. After being handed a start in New Zealand's Tri-Nations opener against South Africa, Jane proved his worth by notching twice, with his first try a stunning solo effort from halfway.He was eventually named in the All Blacks squad for the World Cup, instead of the likes of Sitiveni Sivivatu and Hosea Gear. The winger was spotted drinking and smoking with team-mate Israel Dagg just 72 hours before the All Blacks' quarter-final against Argentina, but he found redemption in the form of sensational performances against the Pumas and the in the final against France as the All Blacks won the World Cup. Early in 2012 he opted to re-sign with the Hurricanes and New Zealand Rugby Union through to 2014.